Special Note - This book is only available through Amazon.com at this time. Please click here to purchase. A unique and engaging first-person account of how the paths of two women crossed in coping with the loss of loved ones. Monica Vest Wheeler writes of how she continued to struggle with grief several years after her mother-in-law's passing, until she connected with a friend's sister, Susie, who was dealing with the recent loss of her boyfriend. Both discover much about life and love as they meet in Myrtle Beach, South Carolina, for a weekend to console each other. 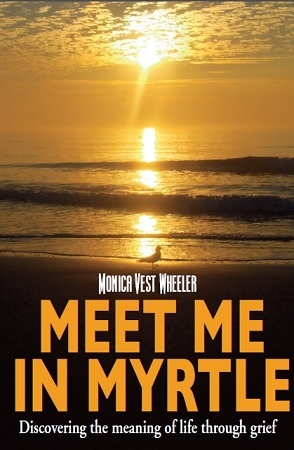 While "Meet Me in Myrtle" is a captivating story on its own, this book is also an excellent resource for grief support groups. It includes talking points to stimulate conversation about a necessary, yet delicate, subject. Monica also writes about coping with the emotional and everyday challenges of coping with catastrophic illnesses and injuries, including Alzheimer's disease, stroke, traumatic brain injury, and other topics.